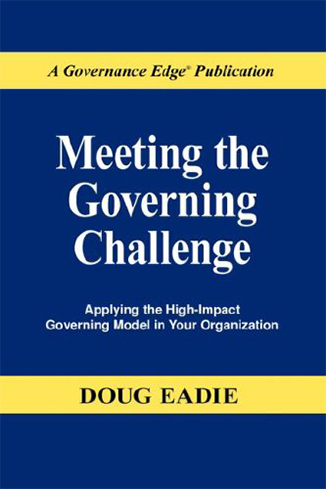 To the point and blissfully free of padding, Meeting the Governing Challenge describes the five key elements of Doug’s High-Impact Governing Model—a powerful tool for developing the kind of board leadership and board-CEO partnership that your organization needs to succeed in carrying out its mission. This practical resource provides you with the nuts-and-bolts guidance to transform your board, teaches a new way to approach decision making, and describes the role of the CEO as Chief Board Developer. Virginia Jacko, President & CEO, Miami Lighthouse for the Blind and Visually Impaired, Inc.
A board-savvy CEO who is a real expert in the field of governance and who takes the lead in building the board’s capacity to do high-impact governing work. A clear, detailed board governing mission and meticulously designed processes for involving your board creatively and proactively in key governing functions. A well-designed structure of board standing committees that serve as “governing engines” in accomplishing the board’s governing work. A board self-management program aimed at building board members’ governing knowledge and skills and strengthening board accountability for its own performance. Strong CEO and executive team support for the board in carrying out its governing functions.